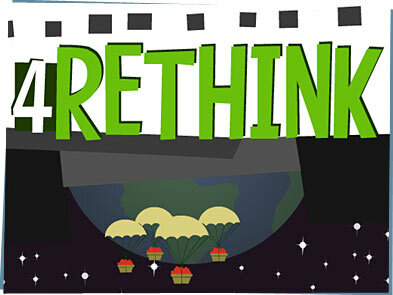 What does RETHINK mean? I have a hard enough time with plain old THINK. It just means we shouldn't think that the way we do something NOW is how we should ALWAYS do it. Take the letters on your computer keyboard. See where they start? Q W E R T Y. You know why? Before computers, people used mechanical typewriters. Each letter was on a metal rod, and popular letters would get tangled up if they were too close together. To fix that, those popular letters were separated. And we still use that system today, even though there are no metal rods to get tangled up. It could be just A B C.
Thanks, Dad. I always welcome the chance for you to brighten our Web site with history lectures. We kids just LOVE the chance to hear about tangled metal rods from the fifteenth century. Nineteenth century. Any time, kid. There's plenty more where that came from. Hey, if we're rethinking things, is this where I propose my Flying-Cars-Driven-By-Bears plan? If it's the one where bears will be driving flying cars, I think not. We need to rethink things to make them better, not just to add more flying bears... as tempting as that may be. I mean, we should be thinking about how we do EVERYTHING. Like do we really need to chop down thousands of trees every day to make newspapers when we have computers and TVs with 24-hour news? Why don't we take our grocery bags and boxes back to the store, like we do with some bottles? Can we build farms in skyscrapers? Would we all need our own cars if we lived in cities? Could we live in space? NOW you're talking! Mom's annoying boyfriend, Hoyt, could live in space. That's some GREAT rethinking. Maybe people reading this Web page can send their ideas to us for rethinking how the world works.